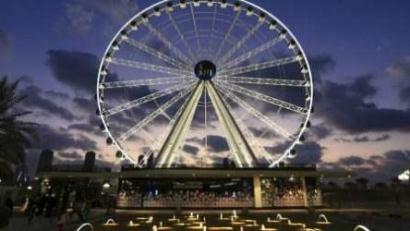 In a monumental move for Sharjah's most recognisable landmark, the iconic Eye of the Emirates wheel is to be completely relocated from its home of 13 years at Al Qasba to Al Montazah Parks, providing even more spectacular bird's eye views across the landscape to a larger number of residents and visitors. The move will provide tourists supreme panoramas over the city's major attractions and famous markets, such as the Central Souq, Al Jubail Souq, Al Majaz Waterfront, Khalid Lagoon, The Flag Island, Al Noor Island, Al Noor Mosque, and various government entities in Al Layya, while being easily accessible to visitors, marking a new era for the wheel and opening a brand new avenue of tourism investment for Sharjah. Marwan bin Jassim Al Sarkal, CEO of Shurooq said: "We are enormously grateful to His Highness Sheikh Dr. Sultan bin Muhammad Al Qasimi, Supreme Council Member Ruler of Sharjah for his support and confidence in this project. "The relocation of the Eye of the Emirates, Sharjah's icon, to Al Montazah Parks aligns with Shurooq's strategy that aims to develop its tourist and recreational destinations, and provide residents and visitors with the opportunity to enjoy Shurooq's attractions. The new location of the Eye of the Emirates will enhance its importance, given the broader views it will feature." "The Eye of the Emirates will be one of the array of state-of- the-art facilities and world-class services at Al Montazah Park that meet the aspiration of all visitors, especially that at the new location it will overlook many premiere tourist destinations in the Emirate of Sharjah. It will have a positive impact on the flow of tourists and visitors and provide them with the opportunity to enjoy a horizontal bird's eye view of the city," Al Sarkal added. Inaugurated in 2005, the Eye of the Emirates wheel is one of Sharjah's most instantly recognisable landmarks, and since then the Eye of Emirates spanned its wheel for hundreds of thousands of people. It is 60 meters high and has 42 cabins. Over the last 13 years, it has become part of the aesthetic identity of the emirate and a tourist icon that is regularly featured on media and social media platforms. The Eye of the Emirates is also recognised for being a beacon of many celebrations Sharjah undergoes and for witnessing numerous events from cultural and art related, to entertainment and family oriented activities, and National occasions and celebrations. This year, the Eye of the Emirates celebrates the Year of Zayed, placing the famous symbol of the late founding father Sheikh Zayed bin Sultan Al Nahyan at the centre of the Ferris wheel.